Top Medicine Specialist Professor Dr. A.B.M Abdullah Contact Number, Designation, Chamber Address, Visiting Time! Hello Dear, welcome to Professor Dr. A.B.M Abdullah – Medicine Specialist Doctor Phone Number, Degree and Chamber Address. There a many kinds of Specialist Doctor available in Bangladesh. Today, we are going to share Medicine Specialist Professor Dr. A.B.M Abdullah Education Biography, Contact Number, Chamber Address and Visiting Time. So, staying with us and follow the below content. Specialist: Specialist in Medicine (All Diseases of Adults). Professor of Medicine & Dean, Faculty of Medicine. Chamber Address 1: Sheikh Fazilatunnesa Mujib Memorial KPJ Specialized Hospital & Nursing College, Main Br. Thanks for staying with us a long time and visiting Top Medicine Specialist Professor Dr. A.B.M Abdullah Contact Number, Designation, Chamber Address, Visiting Time content. 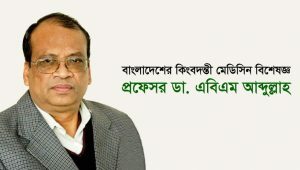 If you have any question about Professor Dr. A.B.M Abdullah information? Just comment here. We reply as soon as possible. I am from Gulshan, and I want an appointment of Dr. ABM Abdullah. Where is the nearest location for me and how can I get an appointmen?